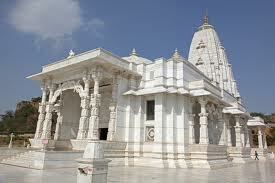 Here is Some Information about Birla Temple in Jaipur Rajasthan India. 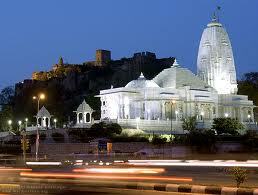 Birla Temple dedicated to Lord Vishnu and Goddess Laxmi is yet another major attraction in the Pink city of Jaipur. The Birla Temple is said to be a replica of a Scottish castle. The temple is situated at the foot of Moti Dungri Fort and is built by the famous and affluent business family of Birlas. 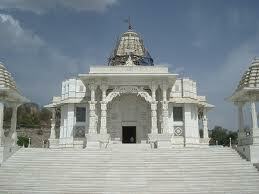 Birla Temple forms one of the major attractions of Jaipur. 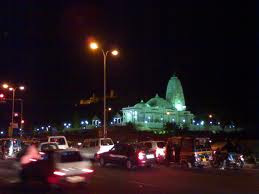 Birla Temple of Jaipur looks stunning, when it is brightly lit in the night. 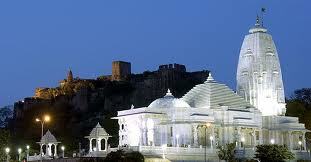 Birla Mandir, in pure white marble, dominates the skyline of southern part of Jaipur. The construction of the temple took place during the year 1988. Today, it reflects the secular ethos of India with its three domes representing varied approaches to religion. The architectural beauty of Birla temple is worth appreciating. Knowledgeable and English speaking guides are available to take the tourists around and explain to them the various aspect of the temple architecture as well as Hinduism. The attractive stained windows glass windows of the temple depict scenes from Hindu Mythology. The idols of the temple look so real as if, they would utter a word just now. Amongst all the idols, the marble idol of Ganesha is a masterpiece which looks almost-transparent. The idols of Lord Vishnu and his consort, Lakshmi attract the attention, being made out from one piece of marble. The temple also portrays great historical achievers, philosophers and religious saints. 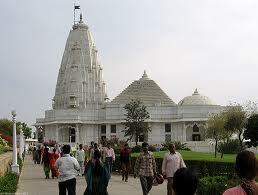 The Laxmi Narayan Mandir is a modern architectural marvel, surrounded by lush green gardens. The fascinating exteriors of the temple are carved splendidly with beautiful sculptures based of mythological themes, while the interiors have a large marble panel portraying mythological events. The Birla Temple has a museum too, which showcases the ancestral valuables of the Birla family. Birla Mandir / Laxmi Narayan Temple is a masterpiece of art and tourists should not miss this architectural spiritual heritage on their trip to Jaipur. 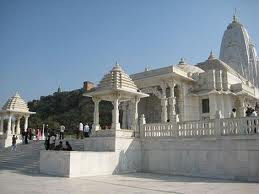 Tours to Jaipur these days are hardly complete without a trip to the Birla temple. 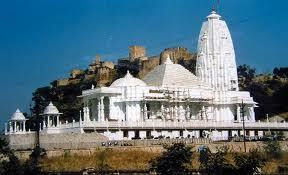 Hence, if you are touring Jaipur, then make sure that you pay a visit to the Birla temple. The visit to the famous temple will surely be an enriching experience as a single visit to the temple will let you an opportunity to get an idea about the architecture of India, spiritual importance of the temple and also the secular state of the nation. The Birla Temple is one of the most revered Hindu temples located on an elevated ground at the base of Moti Dungari hill in Jaipur. The temple was built in 1988 by the famous B.M. Birla Foundation, part of one of India's most famous business families. The temple is dedicated to Lord Vishnu (Narayan), the preserver and his consort Lakshmi, the Goddess of wealth and good fortune. Due to this reason, the temple is also known as the Lakshmi Narayan Temple. The Laksmi Narayan Temple or the Birla Temple of Jaipur is a modern architectural marvel in pure white marble, surrounded by lush green gardens. There are three large domes that represent three major religions in India and represent the secular nature of the temple. The walls of the temple are adorned with various Hindu symbols and quotes from the Gita and the Upanishads. The temple also portrays great historical achievers, philosophers and religious saints such as Socrates, Zarathustra, Christ, Buddha, and Confucius. The main idols of the temple are Lord Vishnu (Narayan) and Goddess Lakshmi whose images are sculpted out of a single piece of marble. The temple has many other small shrines of various Hindu Gods and Goddesses. The image of Ganesh, the protector of households, over the beam at the entrance looks almost-transparent and is considered immensely auspicious. The idols of the temple look as if they would address the onlookers at any time. The beautiful white marble temple mesmerizes the onlookers, when it glows at night. The Birla Temple also has a museum in close proximity, which showcases the ancestral valuables of the Birla family. The museum is open everyday from 0800 hrs to 1200 hrs and then from 1600 hrs to 2000 hrs. There is no entry fee to visit the museum. The Birla Temple looks like a magical palace during the festival of Janmashtami, which is celebrated to mark the birth of Lord Krishna. The whole temple is festooned beautifully with flowers. 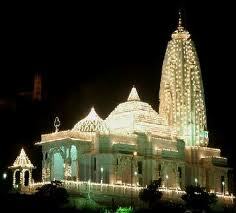 In the evening, the temple glows, as it is illuminated with a thousand light bulbs. The magnificent structure in white marble glows in breathtaking radiance and captivates everyone with its unparalleled beauty. By Road:Jaipur is well connected with main cities and hence we get wide road networks. Regular bus services are also offered from various cities to reach Jaipur. Road transport such as private luxury buses, AC coaches and Rajasthan tourism packages are also available. By Rail:The nearest railway station is Jaipur, from there you get plenty of options such as rickshaws or other private vehicles. There are regular basis trains been schedule for Jaipur. By Air: Jaipur is the nearest airport in Rajasthan. There are lots of domestic airlines that are link with major cities such as Delhi, Mumbai, Bangalore and other. Flights from metropolitan cities are on regular basis. One can easily hire taxi or other private vehicle to reach Birla Temple.